Form Description: Becoming a babysitter is a great way for teens to earn a bit of extra spending cash, and also a great way for them to start learning about how businesses work. One way to help ensure that your teen can learn all they can, get the instructions that they need, and ensure that they receive the agreed upon rate is by using a Babysitting Contract. Not only will your teen be able to have some detailed instructions, but also a firm agreement as to what type of compensation they will receive. This particular edition of the contract has been created with numbered rows and sections. These numbers will allow you and anyone else that takes a look at the form an easier time of later referencing what was put into it. This can be a definite help if, or when, any problems or disputes arise at a later time. 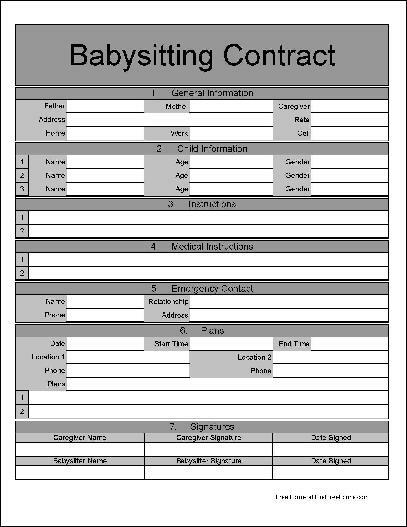 Furthermore, this edition of the Babysitting Contract form has been created with some extra wide rows. These extra wide rows allow you an easier time of entering the information you want by hand. Definitely a huge help when you are trying to figure out the exact information that needs to go into the contract. This form ("Wide Numbered Row and Sections Babysitting Contract") is associated with the following keywords: babysitting, child care, contract, teens, simple, basic, numbered rows, numbered sections, wide rows.